We arrived at Salt Lake City on Friday at 10:30PM and stayed overnight at the Courtyard. The next morning, we got up and had a (quite excellent) breakfast at the hotel and started driving North. 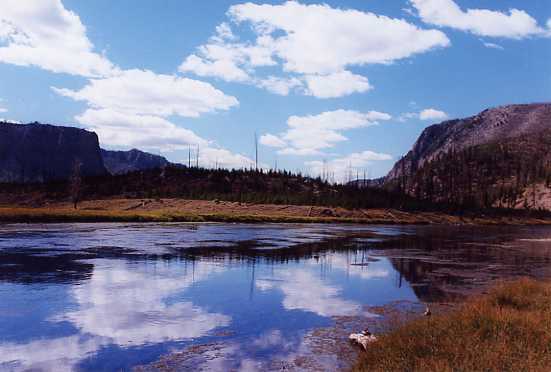 The drive from Salt Lake City to the Yellowstone gate took about 6 hours with only a few quick stops. Speed limits in that part of the country are a bit higher than the Northeast (most of the highway was 70 or 75MPH, so we made pretty good time). 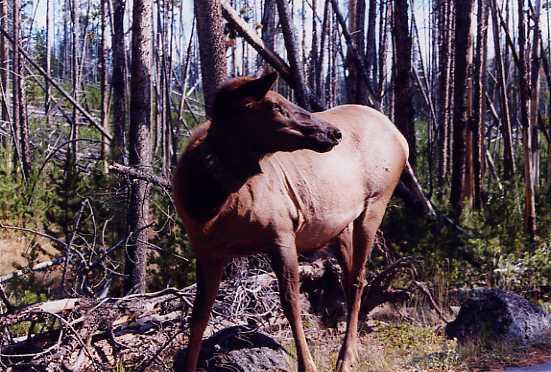 We entered the park at the West Entrance, in West Yellowstone, Montana. These pictures were taken along the road leading from West Yellowstone to Old Faithful, where we stayed. 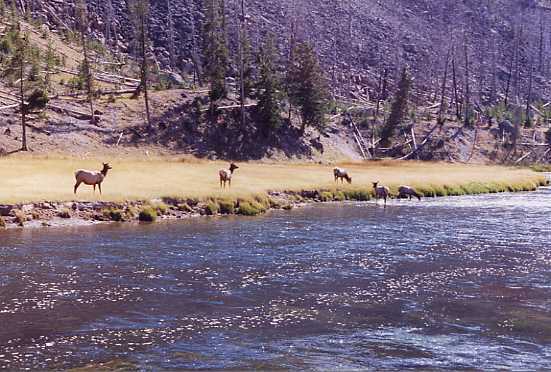 The river shown in all of the pictures is the Firehole River, which runs right along the Upper Geyser Basin (where Old Faithful is located). 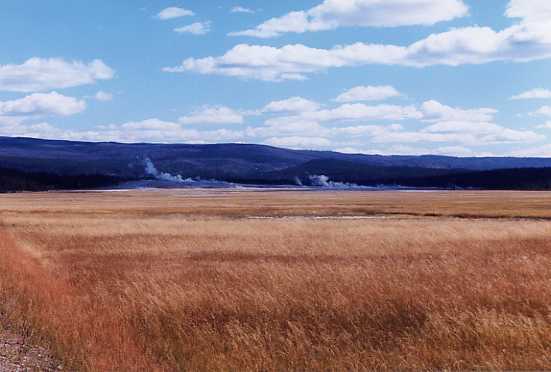 The last picture in this set is the Lower Geyser Basin. 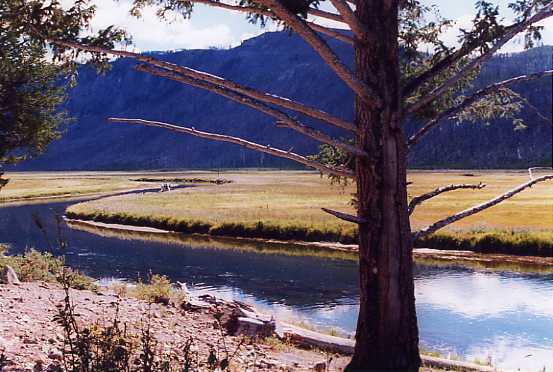 When we arrived at the Old Faithful area, we checked in to our cabin, and started walking around to check out the area. One of the first places we went was the Old Faithful Inn, which is huge. 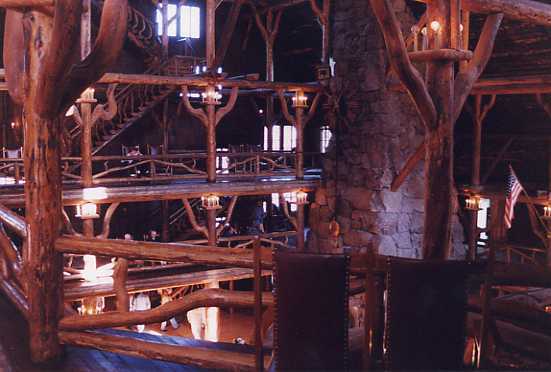 All of the railings and detail work are done with natural wood shapes, which gives the lodge a really odd (and cool) look. One of our purposes for going to the Inn was to get the "schedule" for Old Faithful. As luck would have it, an eruption was predicted about 15 minutes after we arrived. Since it was nearly sunset, the light was just right to catch a rainbow in Old Faithful as it erupted (you can see the rainbow in the second picture). 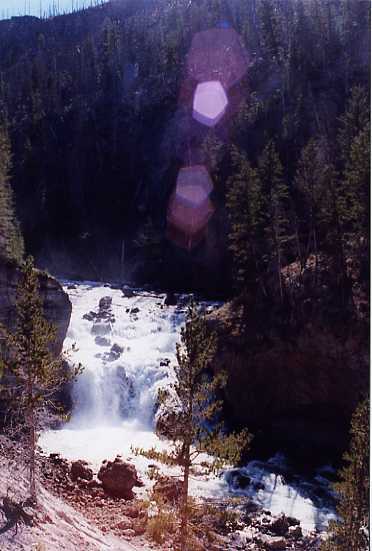 Just to the right of Old Faithful is one of the entrances to the walking paths that cover Upper Geyser Basin. 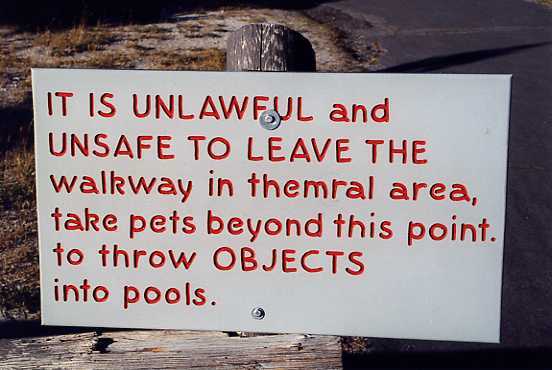 Although the Park Service did a great job warning people, the person who laid out this sign might have been a bit dyslexic. What exactly is a "themral area," anyway? In addition to the Geysers, the Upper Geyser Basin also has some really nice pools. 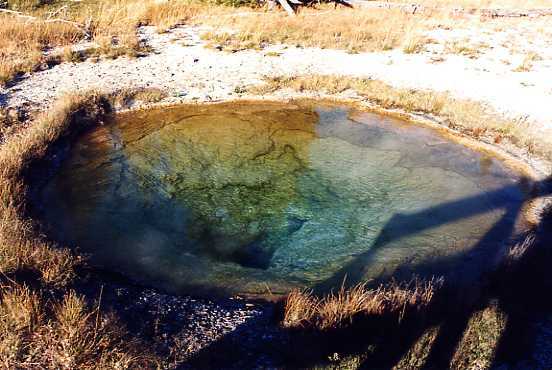 The water in these pools is near boiling point, so you really don't want to take a dip! This one, called Chromatic Pool, has some of the best colors. We got really lucky on the first day. As we were walking by Grand Geyser, we happened to see a bunch of people standing around. An eruption was predicted for about the time we arrived at the Geyser. 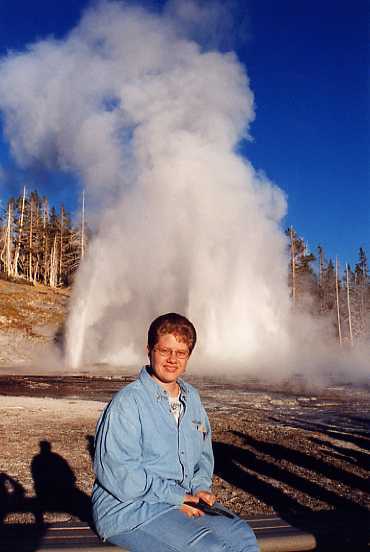 Predictions of Grand Geyser are only within a 4-hour range, so some of the people had been sitting there for a while. 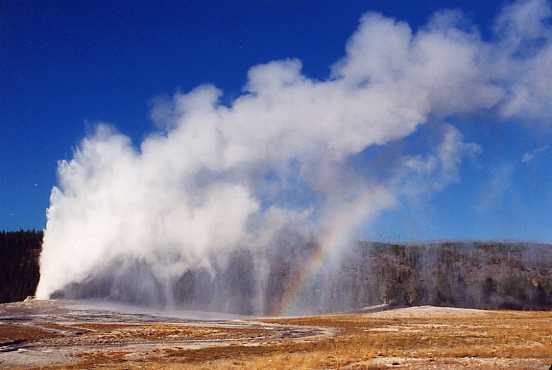 However, one of the folks who was there had seen it erupt, and described the signs of an upcoming eruption (one of the smaller geysers, called Turban Geyser, started an eruption, then Vent geyser started). 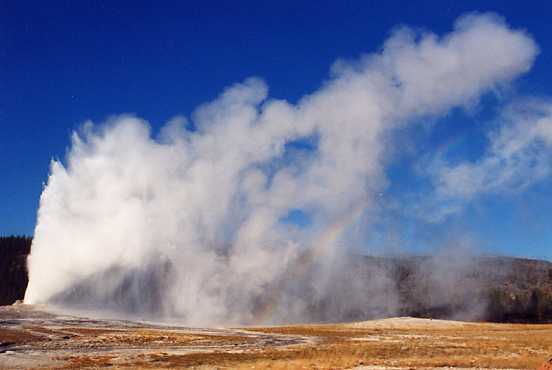 You can see Vent geyser clearly just to the left of Melissa in the first photo. About 2 minutes later, Grand Geyser started up. 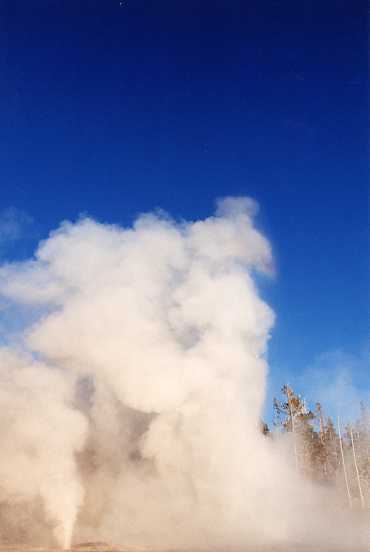 Grand is the largest geyser in the Upper Geyser Basin, and the largest predictable geyser in the world (it pumps out a LOT of steam and water). We were even lucky enough to catch a small rainbow in the eruption (see the middle photo - look very closely at the upper-right corner of the steam), which we were told is extremely rare. After walking around a little more, we went to the Cafeteria for a quick dinner and went to our cabin to rest up for the next day's adventures.